Wipaq provides the right kind of products that will get you through the grind of everyday security issues. 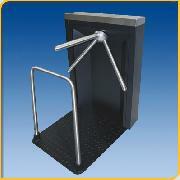 Install their mr100 portable turnstile and you are good to go. It is heavy duty, made of durable material and is easy to maintain. This fits perfectly for the high footfall zones like a mall or any public place like an airport security section. It is simple to operate and takes less space and the portable feature is what makes all the difference. The fail-safe option provides a battery back-up system in the event of a power failure. This option allows the turnstile to continue functioning during a power failure. The MR 100 Portable Turnstile has been designed with smooth, modern lines to blend with a variety of building architecture. The main body is constructed from 14 gauge carbon steel with a ¼" thick stainless steel base plate. Both are protected with a tough industrial-grade black powder coat finish (custom colors or Satin-stainless available). The top cover is made of type 304-brushed stainless steel. The portable feature includes a 5/16" thick diamond tread plate with an industrial powder coat finish (also available in 304 Stainless Steel). A 304 satin stainless steel guide railing is attached to the plate to create a passageway. This portable unit comes with a pair of wheels for easy relocation of the turnstile.